JEDDAH, SAUDI ARABIA: Jeddah is the 2nd largest city in Saudi Arabia situated along the coast of Red Sea. This thriving modern city has everything to give its guests all the comfort they need to make their trip memorable. Jeddah is a huge city where most of the tourist attractions are pretty spread out and not within walking distance. But the good thing is that taxi is very cheap here. TIME of TRAVEL: We flew to Jeddah in end of February, 2012. Weather is actually pleasant this time, you don’t get the desert heat-wave like you would from May-October. EATING and SHOPPING in JEDDAH: We went to Red Sea Mall after spending afternoon near the Red Sea. It was about 10-15 minutes of drive. It is one of the biggest malls in Jeddah with a big food court and many shops. This is where we had Chinese food for an early dinner. 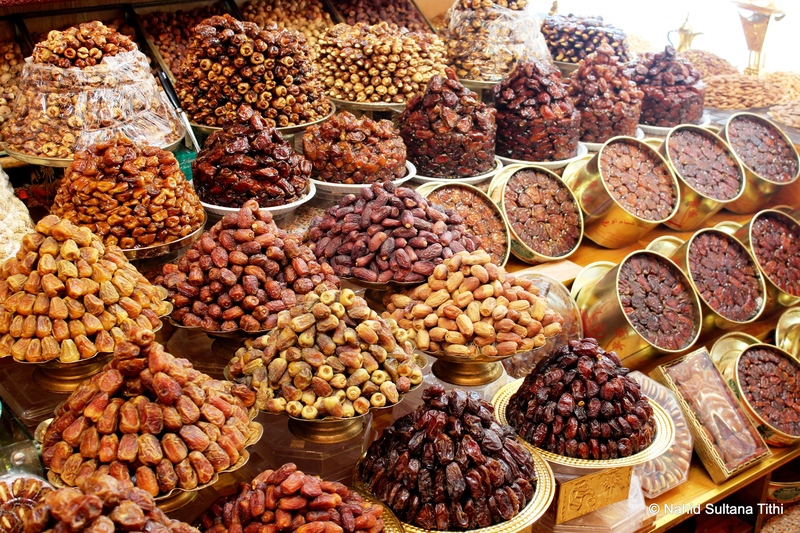 Souk Al-Alawi in the old district of Jeddah is a good place to buy dates; hundreds of different types of dates and dates-filled treats can be bought in bulk or in gift boxes. Al-Balad (Old Jeddah) is another lively place for cheaper gifts, household things or Islamic souvenirs. One thing you have to remember in Jeddah is that since KSA is a Muslim country, everything is closed during prayer times…may be for half an hour maximum and then opens again. Interesting thing was to see vendors leaving their carts (without anyone looking after it) when they go to nearby mosque to pray and no one stealing anything from there. One reason for that is thieves get their hands cut-off if they are caught and proved stealing…it sounds brutal, but this law totally works here. Al-Baik, something similar to Burger King, is probably the most popular fast food place here and offers seriously tasty burgers and fries. Another dish that we tried here was kafta, which is kind of like a combination of meat and rice. But honestly, I found traditional dishes here a bit flat and tasteless. I ended up using hot sauces in most of my dishes to spice things up. 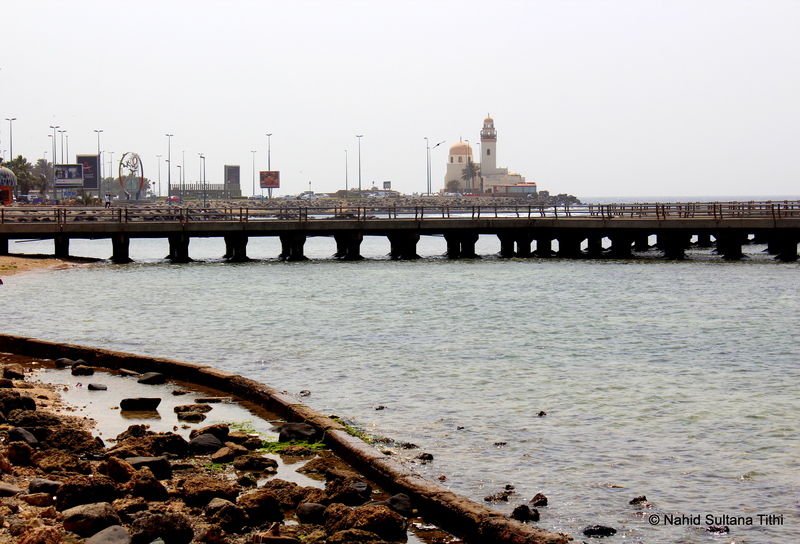 1) RED SEA/JEDDA CORNICHE: Jeddah Corniche offers a spectacular view of Red Sea. This is a beautiful place to be during sunset when it’s not too hot. The beach where we stopped was nice and had a pier to take a little walk that extended onto the water. You can see some nice mosques in distance, big hotel buildings by the shore, and finally, the blue and green serene water of Red Sea. The beach is not really for surfing or taking a bath. But you can go to the water and wet your feet to feel the water of the sea. 2) TOMB of EVE (HAWA AS): This is an enclosed cemetery that has many graves and is surrounded by concrete walls. 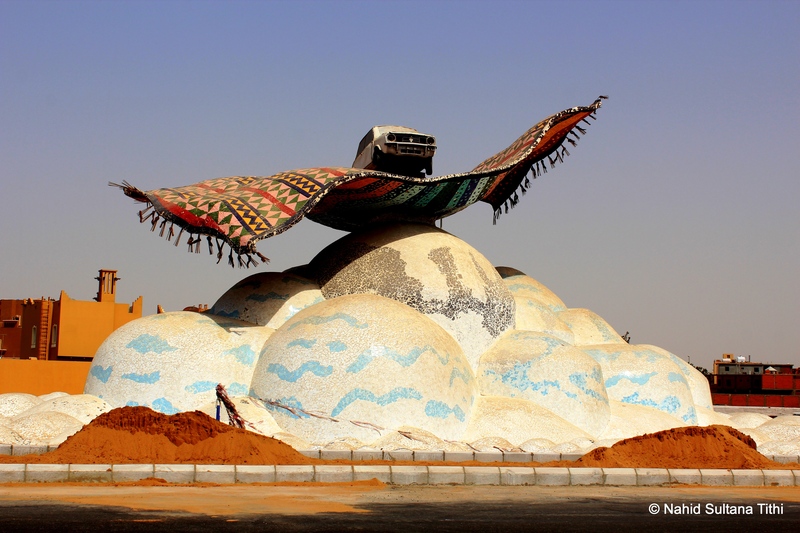 This is strongly believed to the burial-place of the mother of all humankind, Eve or Hawa (AS). 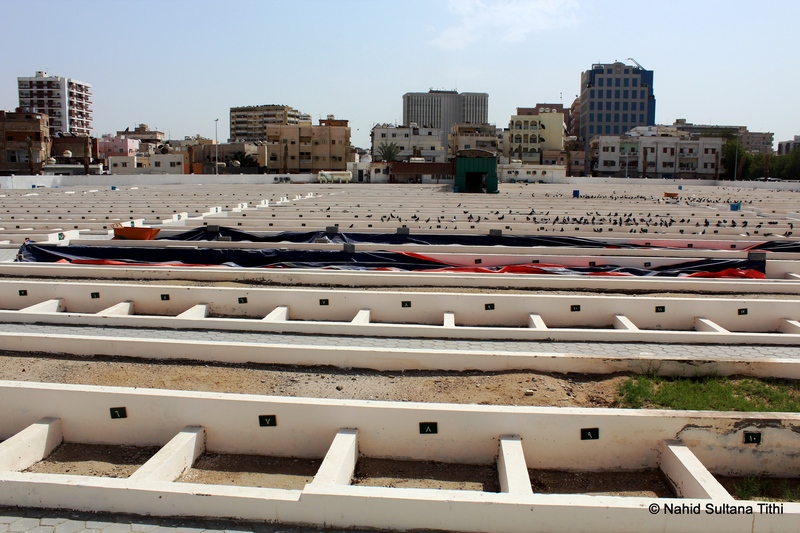 This is a historic archeological site of Old Jeddah. The door was closed for the tourist that day (or may be permanently). Religious authorities built the concrete wall to prevent people going there and praying at the tomb. So we ended up peeking and taking pictures of inside the cemetery by climbing the walls…hehe. Seriously, we did climb the wall to see how it looked inside. Tomb of Eve is said to be one of the longest graves there. We couldn’t pinpoint Eve’s grave since there are many long graves in that site and no graves are marked to prevent it becoming a shrine. 3) AL-BALAD (OLD JEDDAH) & HISTORIC SOUK AL-ALAWI: This is the heart of Jeddah and a place where I could have spent a whole day hoping from one shop to another, wandering around the seemingly endless souks, and looking at ancient buildings. Whatever you buy here make sure you bargain unless they are already marked with prices. Little passageways, historic old architectures, and crowded streets are nice to watch while you are doing some shopping in the souks. 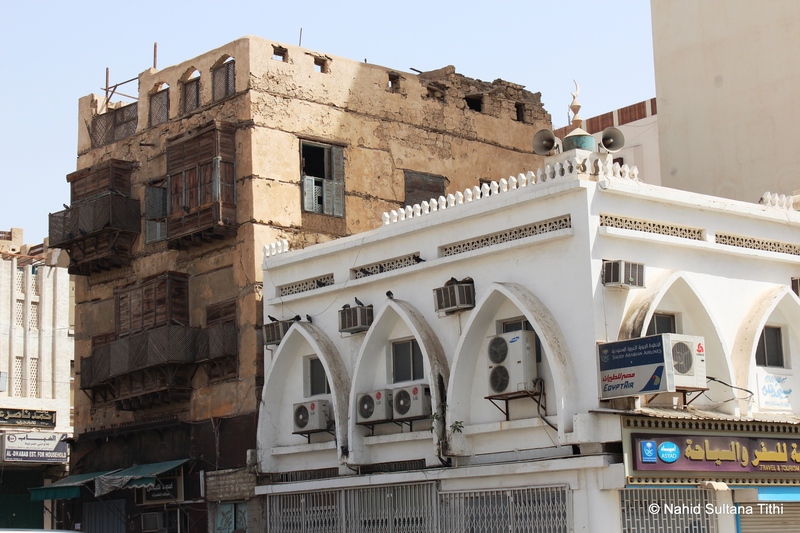 Naseef’s House is a famous building in Al-Balad which was erected about 150 years ago. 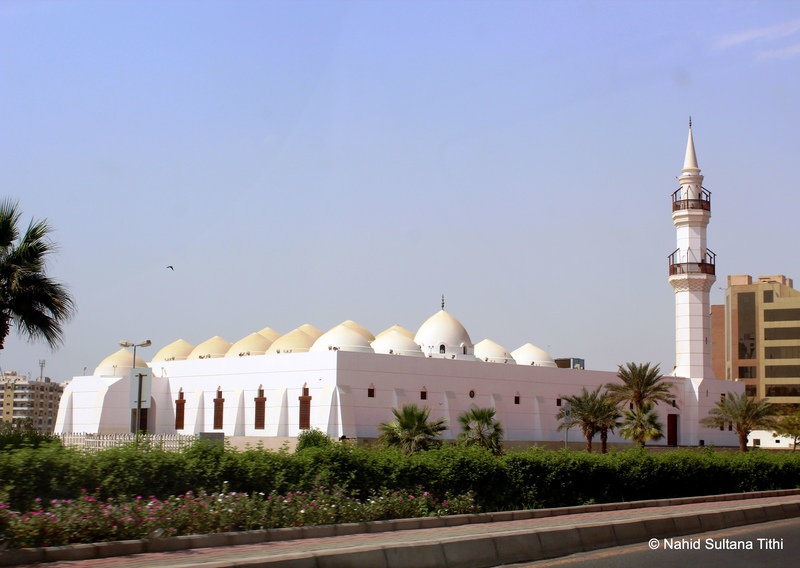 Omar Naseef Efendi was a member of a wealthy merchant family and governor of Jeddah at that time. The building became famous when King Abdul Aziz spent his 1st night in this house after siege of Jeddah in 1925. 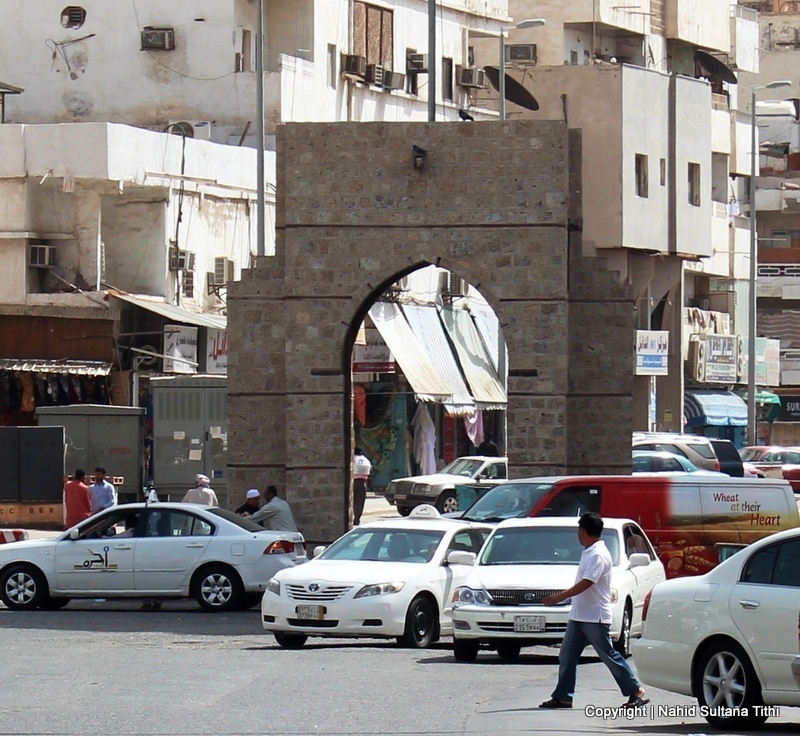 4) BAB-AL-MAKKAH: This old gate was the road to Makkah in old times. It’s located in Old Jeddah in the middle of a busy road. We didn’t get a closer look at this; one of my aunts mentioned it while we were crossing the street and just looked at it from a distance. Al Baik is like Burger King? Offering burgers and fries? Did you even go into an Al Baik while you were in Jeddah? Obviously you didn’t eat anything from Al Baik or you would have never compared it Burger King. Sheesh! Yes honey, we have been to Al Baik twice during our stay in Saudi Arabia and all we had was burgers and fries. And in one of those places they had customer service worst than McDonald’s. Strange because Al Baik is known for its chicken, so it is called the KFC of KSA. You had burgers there and didn’t try the chicken? You missed out. Do enjoy traveling with you on your blog to places I may never get to see in person. Could just imagine soaking my feet in the Red Sea. Thanks! Aww Bev, you are such a great supporter and a sweet heart. I wish I could bring the Red Sea to your feet so that you could soak in its water as long as you wanted. Thanks, visiting Saudi Arabia was an interesting trip…new experience I must say.